While it is common to stress the death and resurrection of Christ, little attention generally is paid to the matter of the Lord’s burial. However, Paul declares that the gospel of Christ involves the death, burial, and resurrection of the Savior (1 Cor. 15:3-4). And when evening was come, there came a rich man from Arimathaea, named Joseph, who also himself was Jesus’ disciple: this man went to Pilate, and asked for the body of Jesus. Then Pilate commanded it to be given up. And Joseph took the body, and wrapped it in a clean linen cloth, and laid it in his own new tomb, which he had cut out in the rock: and he rolled a great stone to the door of the tomb, and departed (Mt. 27:57-60; cf. Mk. 15:43). Here are some interesting and important truths associated with the burial of Christ. From a strictly human vantage point, the burial of Jesus’ body in the manner described above was a radically unusual procedure. Christ was crucified by Roman authorities at the behest of rebellious Jews (Acts 2:23). According to the Latin poet, Horace, it was the Roman practice to leave a body upon the cross until it decayed. He spoke about crucified slaves “feeding crows on the cross” (Epistle 1.16.46-48). not to be buried in the sepulchers of their fathers; but two burying places were appointed by the council, one for those that were slain by the sword and strangled, the other for those that were stoned who also were hanged and burnt (Lightfoot, 2.374; emphasis original). The Jewish historian Josephus wrote: “We consider it a duty to bury even our enemies” (Wars 3.8.5). But, as one scholar has observed, an “area far outside the city of Jerusalem had been consigned for the burial of executed criminals” (Lane, 578). Professor Lane cites ancient Jewish sources in support of his statement. Additionally, it has been noted that for Pilate “to release the body of a condemned criminal — especially one condemned of high treason — to someone other than a relative was highly unusual” (Wessel, 8.785). Why would the governor permit the corpse of this Jesus, who had created such an upheaval throughout the region, to be released to anyone — particularly in view of the fact that Christ had foretold his own resurrection? Sir, we remember that that deceiver said while he was yet alive, “After three days I will rise again.” Command therefore that the sepulcher be made sure until the third day, lest haply his disciples come and steal him away, and say unto the people, “He is risen from the dead”: and the last deception will be worse than the first (Mt. 27:63-64). The burial of the Savior’s body conformed to neither Jewish nor Roman custom, in terms of how the remains of criminals were dispatched. Why was this the case? The immediate explanation lies in the fact that Joseph was an influential Jew of “honorable estate” (Mk. 15:43), who “asked for the body of Jesus.” And Pilate, the Roman governor, for reasons not explained in the biblical text, “commanded it to be given up” (Mt. 27:58). The ultimate explanation, however, is to be found in the fact that divine prophecy foretold that though Jehovah’s suffering Servant would be “assigned a grave with the wicked” (NIV), nonetheless he would be buried “with a rich man in his death” (Isa. 53:9). Divine Providence clearly was at work in the fulfillment of this prophecy. Wicked ... rich: the former is plural and the latter is singular. If Isaiah had merely intended the contrast between a shameful and a sumptuous burial, he would have used two singulars. The use of a plural and a singular suggests that he is talking not about categories but about actual individuals (337). He goes on to point out that only Matthew’s record of Jesus’ burial in Joseph’s tomb can be the fulfillment of the prophecy. Though Christ’s enemies doubtless intended that his grave be that of a common criminal (he was crucified between two thieves), it is absolutely remarkable that a prophet, seven hundred years earlier, foretold that the Lord would be buried with the “rich.” As observed already, this clearly is at variance with a reasonable expectation. How could such a prediction possibly have happened by chance? It could not have. Ordinary human beings are unable to predict the future — no matter how many ridiculous claims there are to the contrary. However, He who knows “the end from the beginning” is able to see the future, cause it to be written, and finally fulfilled (Isa. 46:10). 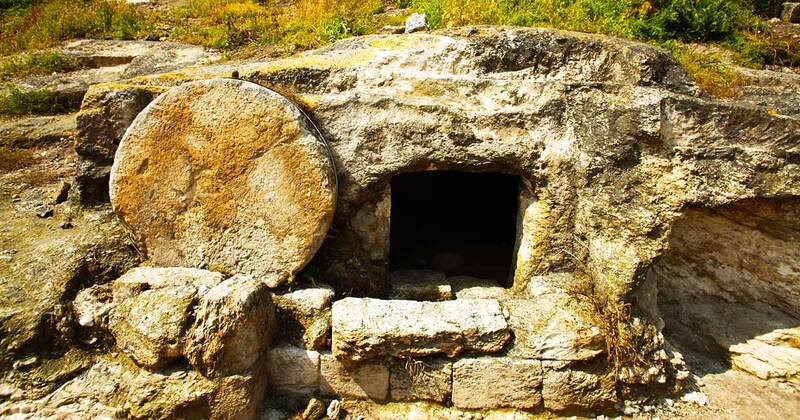 It was essential that the location of the tomb be readily known, in view of the fact that some, likely in their opposition to the doctrine of the resurrection, would protest that Christ had not been raised, but the location of his grave simply was unknown or had been misidentified. This futile explanation has been attempted many times across the centuries. But that view cannot be valid in view of the Jerusalem circumstances. Christ was buried in the tomb of a very prominent man. His tomb was not shrouded in obscurity. Further, the tomb was marked and authenticated with a Roman seal. If a door had to be sealed, it was first fastened with some ligament, over which was placed some well-compacted clay [or wax], and then impressed with the seal, so that any violation of it would be discovered at once (Job 38:14; Song 4:12; Mt. 27:66) (McClintock, 9.492-493). It would be absurd to assume that the Romans kept no records of such important documentation. The burial of Jesus, therefore, is a matter of supreme importance — intricately related to both the Savior’s death and his resurrection. And it should not be passed over lightly. There is a final matter that warrants some reflection. It is commonly asserted that Jesus’ body was embalmed. That term is never used with reference to the preparation of the Lord’s body. Certainly, he was not embalmed with any method analogous to what the Egyptians practiced, where the remains were mutilated (see Morris, 496, 730). The Jews anointed the body with spices when such could be afforded. This would retard the stench of decomposition (cf. Jn. 11:39; see Borchert, 282). But here is an important observation. The fact that the friends of Christ provided spices and anointed his body for burial clearly reveals that they had not grasped the significance of Psalm 16:10 — namely that his flesh would not experience “corruption” (cf. Acts 2:25-28) because he would be raised. What is the importance of this point? After Jesus’ death, the disciples did not concoct some outlandish plan to steal the body and proclaim that he had been resurrected, because they did not anticipate the resurrection! They fully expected the corpse to decay and return to the dust. But on that Sunday following his death (and subsequently for 40 days), the sight of him alive produced their faith in the risen Lord. This is extremely powerful circumstantial evidence of the genuine resurrection of the Savior’s body. Christianity is based upon a buried and resurrected Lord. The religion is genuine and stands unique, in contrast to all other religious systems — either ancient or modern. Borchert, Gerald L. (2002), The New American Commentary – John 12:21 (Nashville: Broadman & Holman). Lightfoot, John (1976), A Commentary on the New Testament from the Talmud and Hebraica (Grand Rapids: Baker). Motyer, J. Alec (1999), Isaiah – Tyndale Old Testament Commentaries (Downers Grove, IL: InterVarsity Press). Wessel, Walter (1984), â€œMark,â€ The Expositorâ€™s Bible Commentary (Grand Rapids: Zondervan).